A registered post was sent to me by the survey company but some way somehow it got lost. The survey company contacted me 12 days ago, informing me that they will resend my rewards that I redeemed through normal post. It arrived in my mail box 2 days ago. 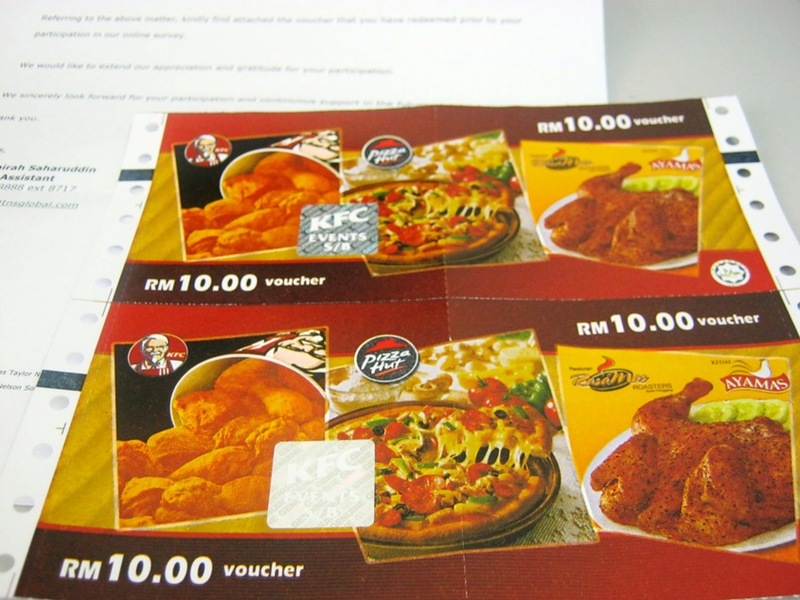 Though I have been receiving these vouchers many times before, I always have the thrill of opening the envelope each time I receive them. Taking survey is rewarding. I tried not to miss any surveys allocated to me by the survey companies that I joined. Because each completed survey I take, there are points given. Through these points I could either redeem money by cheque, KFC/Pizza Hut/Ayamas vouchers like this one, McDonald's vouchers, shopping vouchers at major local super/hypermarkets, or I could choose to give charity donation. Each individual survey companies reward their members differently. To participate in taking surveys, one will have to register as a member with the survey company. An email will be sent to the member's registered email informing them of any survey waiting for them to complete. At times, you might not qualify for a survey but it's ok, there are more coming through from time to time. It normally takes 5-30 minutes to complete a survey, each surveys are different. By taking market surveys, it gives us the opportunities to voice our opinions on the products/services that are already in the market and also of those new products to be launched in the near future.